RBTH presents a selection of views from leading Russian media on international events, featuring reports on the results of the presidential election in Kazakhstan and EU discussions of the dwindling financial options for Greece, as well as a preview of the upcoming Non-Proliferation Treaty Review Conference in New York. Online newspaper Gazeta.ru reviews the outcomes of the early presidential election in Kazakhstan. As was expected, it has been won by the incumbent president, Nursultan Nazarbayev, with over 97 percent of the vote. A source familiar with the situation told the website that the long-serving president’s decision to seek another term in office was largely a reaction to the developments in Ukraine. 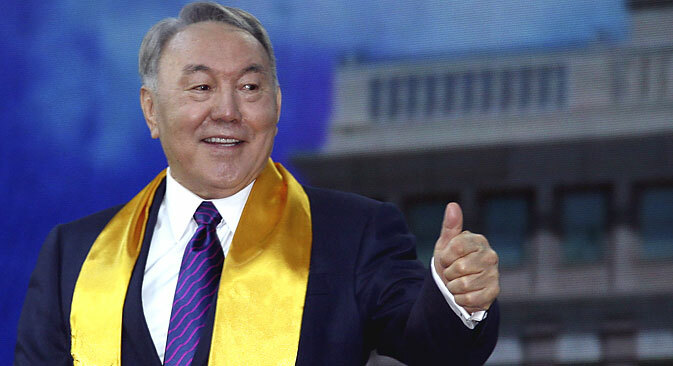 Pundits point out that for the 72-year-old Nazarbayev the new term should mark the start of decisive reforms aimed at strengthening the country’s statehood. Gazeta.ru quotes political commentator Arkady Dubnov as saying that Nazarbayev is seeking to build a civic nation in Kazakhstan in order to remove disagreements between ethnic Kazakhs and other ethnic groups. If the reforms in Kazakhstan become a success, “it would become a challenge for Russia too,” where similar projects have been kicked into the long grass, the pundit adds. The centrist newspaper Nezavisimaya Gazeta reports that at a meeting in the Latvian capital Riga, eurozone finance ministers and the management of the International Monetary Fund discussed possible ways to help Greece out of the financial crisis that it has found itself in. Athens has once again failed to pay its creditors and the participants in the meeting made it clear that Greece cannot expect to receive any further financial allocations. Furthermore, some delegates for the first time said they could not rule out a Greek exit from the eurozone. In the opinion of Anatoly Bazhan, deputy head of the economic research section at the Russian Academy of Sciences’ Institute of Europe, the root of the Greek problem lies in the weakness of the Greek economy and its inability to compete on the open EU market. “The situation may resolve thus: European partners will stop granting loans and Greece will automatically have to revert to the drachma,” Bazhan told Nezavisimaya Gazeta. As regards the Greek government’s reform plan, which has so far failed to secure the approval of the EU, Bazhan said the reforms should lead to a reduction in spending and to a smaller, preferably zero, budget deficit. Then it would be possible to curb the growing state debt. “However, it would lead to a rise in unemployment and a drop in earnings,” he added. Nezavisimaya Gazeta concludes that the Greek authorities are in a critical situation with a high risk of social turmoil. The Kommersant business daily looks ahead to the Non-Proliferation Treaty (NPT) Review Conference, which opens in New York on April 27 and will last four weeks. According to the paper’s sources, progress at the conference may be impeded by the heightened tensions between Moscow and Washington, one of the causes of which is the implementation of the Russian-U.S. Intermediate-Range Nuclear Forces Treaty (INF). Kommersant reminds its readers that the U.S. has accused Russia of violating this treaty, while Moscow has rejected those accusations and has put forward reciprocal complaints. Furthermore, Moscow points out that a situation wherein non-nuclear NATO member states take part in military exercises whose scenario envisages the use of nuclear weapons is in violation of the NPT. In addition, the paper continues, the Ukrainian delegation, possibly together with representatives of several East European countries, intends to raise the issue of Russia’s compliance with the 1994 Budapest Memorandum. Under this agreement, Ukraine gave up the nuclear weapons which remained on its territory after the break-up of the Soviet Union, and in exchange, Russia, the U.S. and the UK guaranteed its security and territorial integrity.